Amazon.com description: Product Description: The three coeditors knew John Butterworth for many years and had worked closely with him on a number of research projects. We respected him as a valuable colleague and friend. We were greatly saddened by his untimely death. This book is an attempt to remember him. We dedicate the volume to John with thanks for the contributions he made to our research, to the Faculty of Commerce and Business Administration at the University of British Columbia, and to the accounting profession. This volume contains twelve invited papers on the general topic of the economic theory of information and contracts. We asked leading scholars who had known John to contribute papers. The response was very gratifying. The authors provided us with new strong research papers that should make a lasting contribution to the accounting and information economics research literature, and make us all proud to have put this volume together. 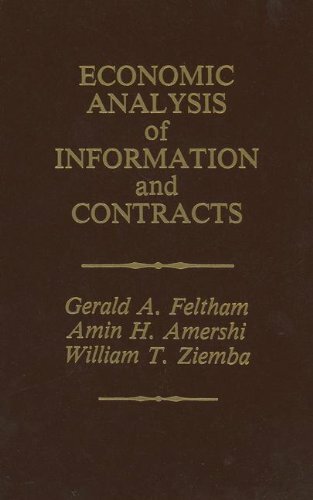 The research papers in the volume are in three sections: information evaluation in multi person conte)l:ts; contracting in agencies under moral hazard; and contracting in agencies with private information. We begin part I with Jerry Feltham's review of John Butterworth's pioneering contributions to the accounting and information economics literature. This is followed by an introduction to the papers in the volume and the papers themselves. About: The three coeditors knew John Butterworth for many years and had worked closely with him on a number of research projects.